It's pretty rare for us to promote an item that we don't sell on our own website, but I was so excited when I saw this Easter Countdown from The Dating Divas and knew my readers would enjoy it too! Ever get the feeling that the holidays pass you by so quickly that it's just a blur of chocolate and chaos? I know I do. We get in the habit of of going through the motions of a typical Easter without slowing down to think about what we're really celebrating. Well, this year I'm determined to make each holiday count, and I found the perfect way to do it for Easter this year. The Dating Divas have a countdown to Easter, and the best part? It's full of Christ-Centered traditions (and it's adorable, too)! You can use it to create treasured family memories of faith and the real importance of the season, every single year. Alexa of AlexaZDesigns designed all of the cute and user-friendly printables for the pack. If you've bought one of our packets, then you'll be familiar with how this works!All you do is buy the pack, and it gets sent right to your email. Then you just download, and print it out! Easter Envelope Countdown Banner - Each letter on the banner is a pocket that holds a Christ-Centered Activity or Conversation Card for each day of the 2-week countdown. Thoughtful Easter Conversation Cards - Scriptures and questions to guide evening conversations and get your family talking as you explore the last few weeks of Christ's life. Creative Christ-Centered Activity Cards - Help kids learn more about the meaning of Easter with creative activities. Printable Easter Activities - Adorable printables to enhance certain activities that help teach, explore, and understand the importance of Easter. Bonus Easter Basket Tags - Special tags that can be added to a few Easter basket items as a little reminder of the Savior. 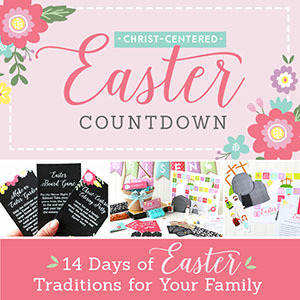 If you want to start these easy, Christ-Centered Easter traditions with your family, grab your printable pack now and start diving into the real meaning of this beautiful holiday. You can grow together as you explore the Savior's life in a creative and thoughtful way.